Rocking Dog Ranch has an assortment of sheep for different levels of dog herding. In my flock, my Cheviot wool sheep are the heaviest and are used to start dogs out. The sheep stay with the handler giving greater ease of control to the dog. Dog-broke Katahdin hair sheep are available for dogs as they become more experienced. These sheep have a goat-like appearance and move quickly helping dogs to learn to cover the sheep. 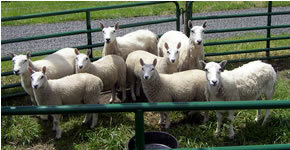 A small herd of Finnsheep will be arriving soon and will make a nice addition to the herding sheep at Rocking Dog Ranch. 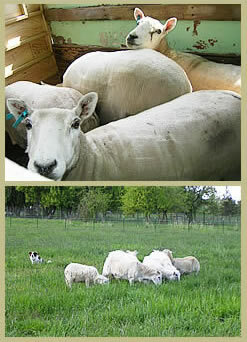 Rocking dog ranch looks forward to its first lambing season in the spring of 2006!